Southern Pacific Souvenir of the Golden West playing cards featuring the Sunset, American Canyon and Shasta Routes, published by the Interstate Company exclusively for Southern Pacific News Service, c.1915. Each card shows an oval photographic scene with a different tone for each suit. The backs feature a view of Mount Shasta. 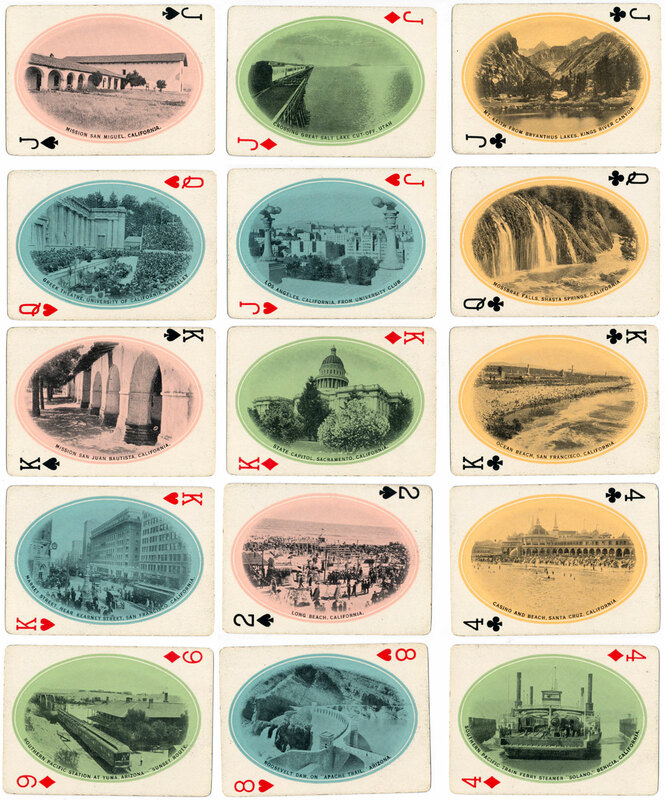 Above: Southern Pacific Souvenir of the Golden West playing cards published by the Interstate Company, after 1915. 52 cards + joker + extra card with gilt edges in box. The deck includes a booklet giving conscise information regarding the subject pictured on each card. Images courtesy Matt Probert.